Originally posted: December 27, 2017 . Last modified: April 3, 2019 . 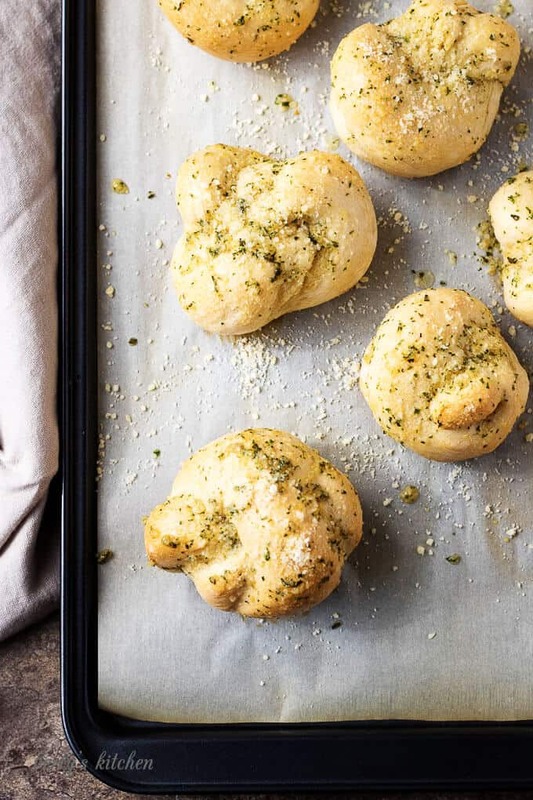 This garlic knots recipe creates soft, chewy, little knots of bread covered with warm butter, fragrant garlic, and savory Parmesan cheese. They’re an excellent side to pasta or pizzas. 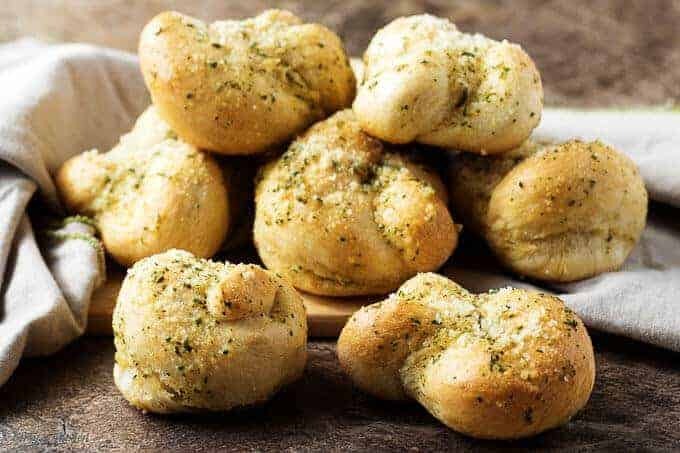 Why waste time searching for “garlic knots near me” on your phone or laptop when you can make them at home? Plus, you never know how good they will be from a restaurant. Why spend the money when you have a great recipe within your reach. 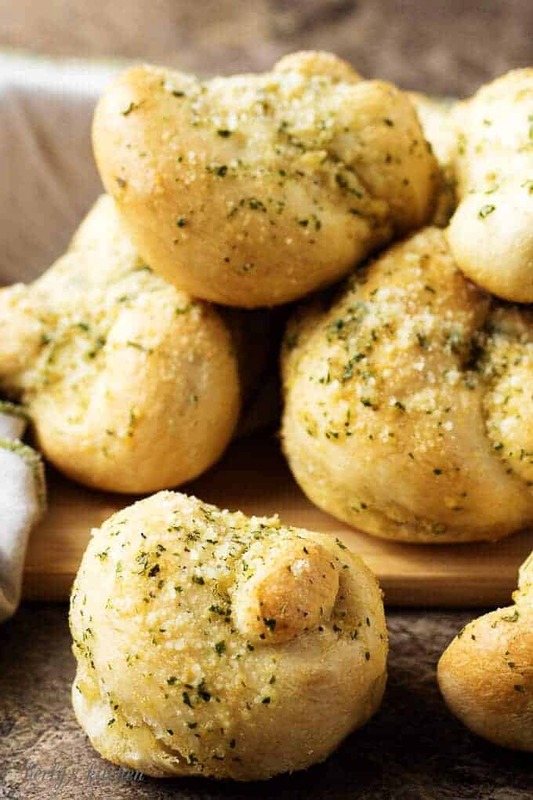 All you need for this garlic knots recipe is a simple pizza dough. We used our own pizza dough recipe to make these garlic knots and they turned out perfectly. 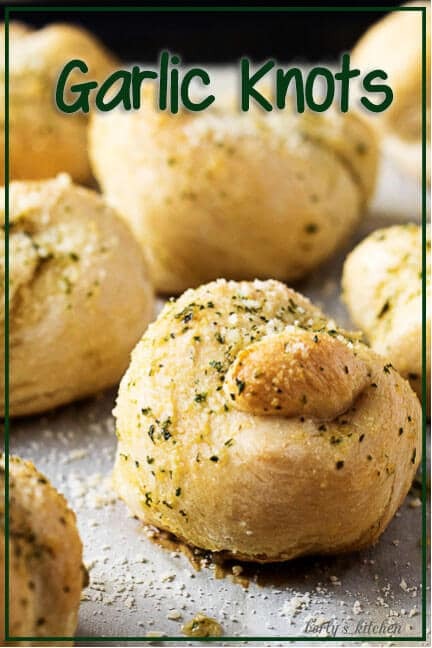 I invite you to give this garlic knots recipe a try for yourself. Before starting this recipe, make sure to gather all your ingredients. The whole process takes a little time, so it’s nice to have everything organized and ready to go when you need it. In a small bowl, add the sugar and yeast to warm water and stir to dissolve. Set it aside and allow the mixture to become light brown and foamy. While you wait for the yeast to activate, place the flour and salt in the bowl of a stand mixer. Use a whisk to combine. Once the yeast mixture becomes foamy (about 10 minutes), pour it into the bowl of flour. Use a dough hook attachment and mix on medium speed for 5 to 6 minutes until a smooth, elastic ball of dough forms. 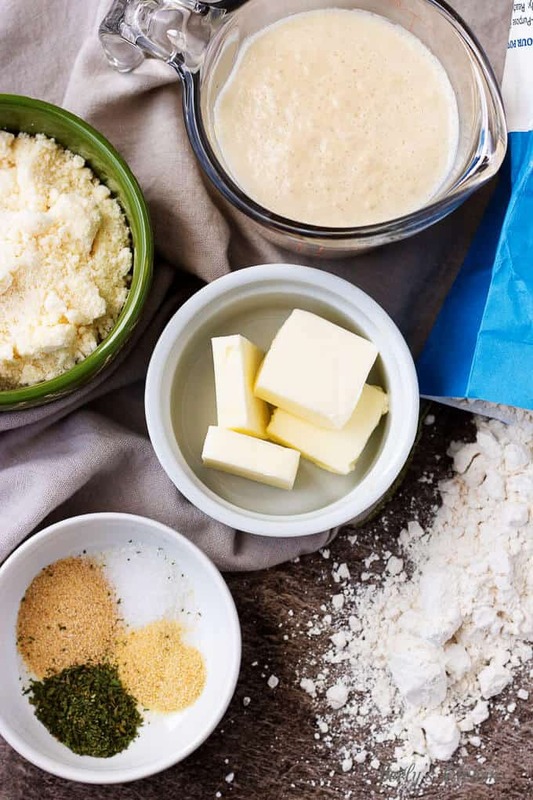 Remove the dough from the mixer and place it in a large bowl. Cover the bowl with a clean towel or plastic wrap and place in a warm area. Allow the dough to rest and double in size (about one hour). When the dough doubles in size, remove it from the bowl and place it on a well-floured surface. Knead it a couple of times by hand to deflate it. Use a rolling pin to roll the dough into a large rectangle about 1/2 inch thick, and cut the dough into 1-inch wide strips. Take each piece, one at a time, and roll it between your hands so the strip twists, like a rope. Tie each strip in a knot and tuck under the loose ends. *Don’t over-tighten the knots because as they’ll expand as they rise a second time. Now, place knots on a baking sheet lined with a silicone mat about 2 inches apart and cover with a clean towel. 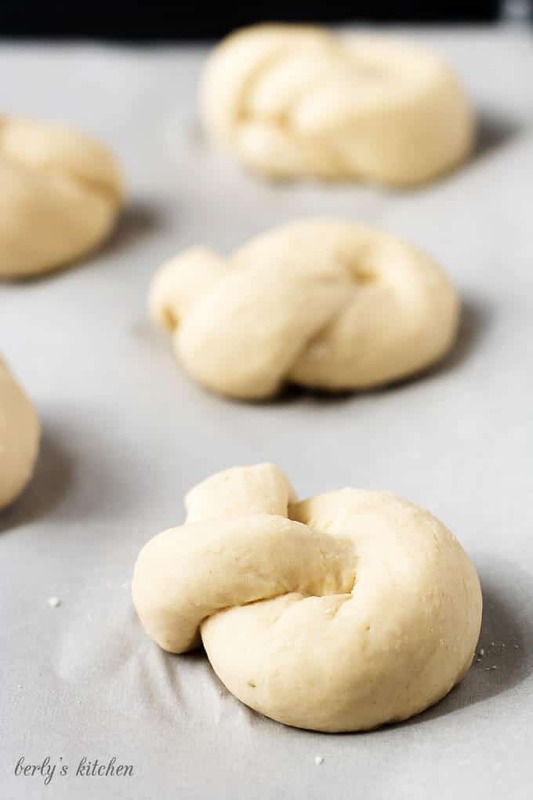 Allow the knots to rise for 30 minutes then put the baking sheet in an oven preheated to 400 degrees F.
Remove the knots from the oven and transfer to a cooling rack. For ease of clean up, place the cooling rack over paper towels. Combine melted butter, garlic powder, salt, onion powder, and garlic in a small bowl and whisk until combined. Use a pastry brush to apply the mixture to the knots. Top with grated parmesan cheese. 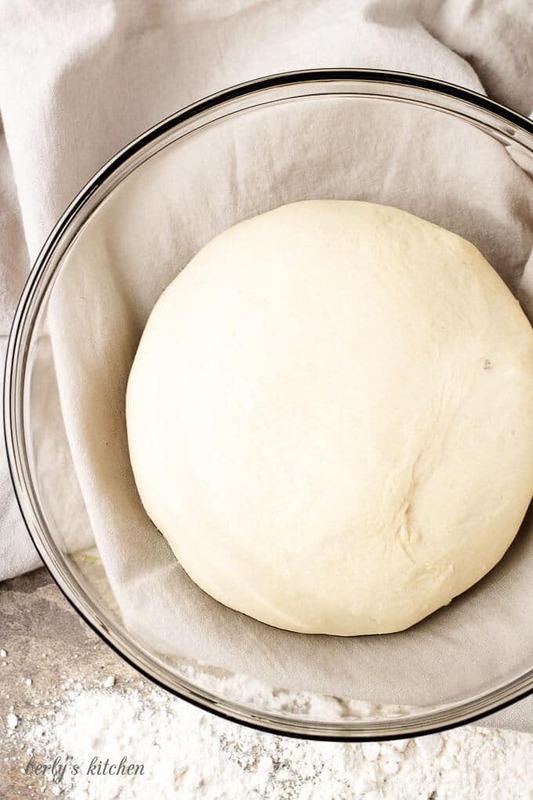 Use olive oil in the mixing bowl to keep the dough from sticking as it rises. When rolling out the dough, add extra flour if it’s too sticky but don’t overdo it. You can use just about any pizza dough recipe for garlic knots and breadsticks. Want more homemade bread recipes? You may like our English Muffin Bread, Sticky Bun Braided Bread, and Braided Jalapeno Cheddar Bread. 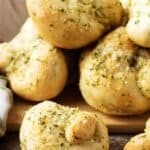 This garlic knots recipe creates soft, chewy, little knots of bread covered with warm butter, fragrant garlic, and savory Parmesan cheese. They're an excellent side to pasta or pizzas. First, using a glass measuring cup or bowl, combine warm water, sugar, and yeast. Set aside for 10 minutes and allow yeast to activate. Next, place activated yeast mixture, flour, and salt in the bowl of a stand mixer. After that, use the dough hook attachment and mix on medium speed for 5-6 minutes until dough is smooth and elastic. Then, remove the dough from the bowl and place in a separate clean, greased bowl. 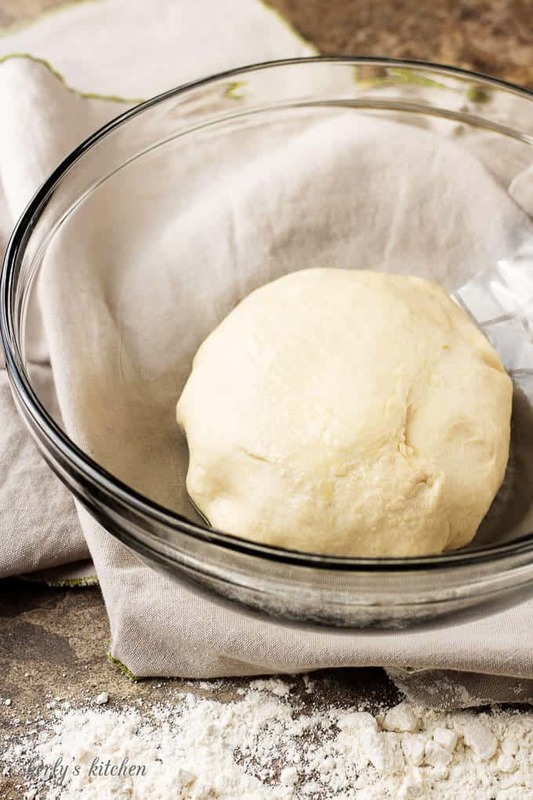 Afterward, cover the bowl with a clean kitchen towel, place in a warm area and allow the dough to rise for about an hour or until doubled in size. First, preheat oven to 400 degrees. Now, after the dough has doubled, place dough on a well-floured surface. 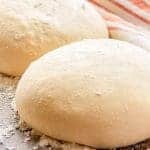 Use a floured rolling pin to roll the dough to 1/2 inch thick. Next, use a pizza cutter to cut the dough into one inch wide strips. Then, take each strip individually and roll it in your hands to form a twist like a rope. After that, tie each strip in a knot and tuck in loose ends. The knot does not need to be tight. Once they are tied, place each dough knot on a silicone lined baking sheet two inches apart. 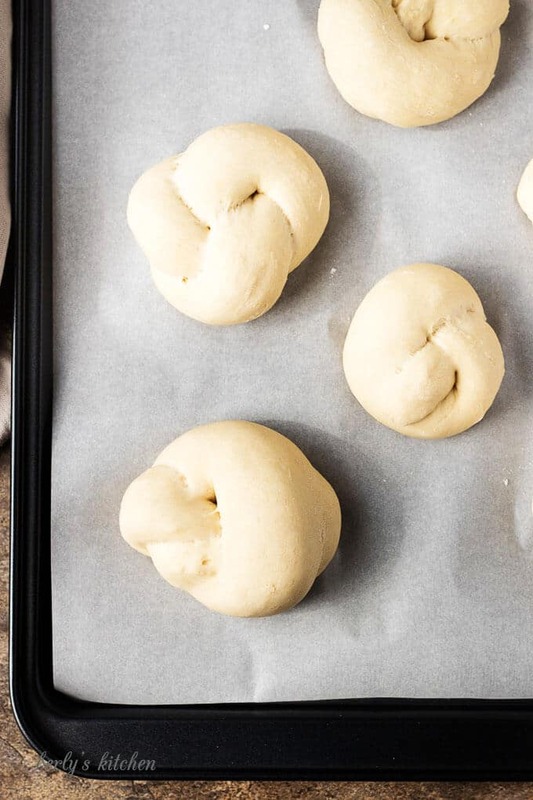 Cover the dough knots with a clean towel and place in a warm area. Let them rise for about 30 minutes. Then, after they've risen, place the knots in the oven to bake for 12-15 minutes or until lightly browned. Last, remove them from oven and place the knots on a cooling rack set on top of paper towels. First, melt the butter and combine it with the garlic powder, salt, onion powder, and parsley in a small bowl and whisk until combined. Next, using a pastry brush, apply the mixture to warm knots. Last, top the knots with grated parmesan cheese. The calories listed are an approximation based on the ingredients and a serving size of one garlic knot. The garlic knots can be stored in a sealed container for up to three days. What happens when you put parmesan and garlic together? MANGIA, baby! These look absolutely delicious! A must-try! These look SO good! I think I need to have a baking day soon so that I can try them out. Wow these look amazing, I love anything with garlic, the more the better for me! Ou, these look so yummy! I am a huge fan of carbs so I have to make these. I keep meaning to make these, but I never get around to it. These look so yummy – time to break out the flour! These look amazing! My dad always made homemade bread and rolls, and always knotted his! These are lovely, and they’re inspiring me to try my hand at them! Cheers! I LOVE GARLIC TOO!! Bread is always better with garlic. Anything is better with garlic! My Hubby does not agree, but I love it. And then there is nothing better than bread….. mmmm! Great recipe!! Thanks, Jennifer! They are great with pizza, pasta, or a bowl of marinara. 🙂 Have a great weekend! Thanks so much for the comment, Albert! These are hands down my favorite side dish for pizza and pasta. I completely agree; it would be easy to eat 20!! Lol! Have a great weekend! I love garlic rolls! These look amazing! Thank you, Deanna! Garlic rolls are one of our favorites as well. Okay, SWOON. These babies look beyond amazing. The perfect side to go along with… well… anything!